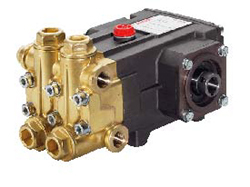 Hawk®, high-pressure piston pumps are positive displacement pumps. 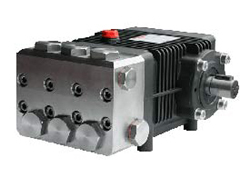 The main parameters that determine your choice of Hawk® pump are volume, pressure, rotation speed and power input. The flow-rate is given in litres per minute and is directly proportional to the rotation speed. The speed of rotation is given as revolutions per minute. The pressure is given in bars and is the maximum pressure that the pump can reach. The power input is shown in kW and is the input required for the maximum flow-rate and pressure indicated. When coupled with an electric motor, the power of the motor should be greater than that shown in the catalogue. When coupled with a combustion engine, the power of the engine should be at least 30% more than that shown in the catalogue.